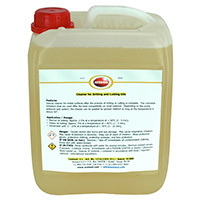 IMS Company - Drilling and Cutting Oil Cleaner, 1.3 Gal (5 L) Canister/Jug. Special Cleaner for Metal Surfaces when Following the Process of Drilling or Cutting Contains Corrosion Inhibitors for Surface Protection. Product can be used in Bulk or Applied with Various Spray Applicators. Drilling and Cutting Oil Cleaner, 1.3 Gal (5 L) Canister/Jug. Special Cleaner for Metal Surfaces when Following the Process of Drilling or Cutting Contains Corrosion Inhibitors for Surface Protection. Product can be used in Bulk or Applied with Various Spray Applicators.